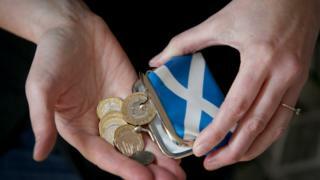 Independence: Could Scotland keep the pound? Several countries around the world use the currency of another state - most commonly the dollar, used in Ecuador, Zimbabwe and El Salvador. For an example closer to home, Montenegro currently uses the euro, despite not being a member of the European Union. The drawback is that when using someone else's currency without permission, you have no input on monetary policy, such as setting interest rates. This could create problems if, for example, one country was in recession and required a cut in interest rates, but the other country - which had the power to set monetary policy - was growing strongly and decided to raise rates instead.The Fraser of Allander Institute - an economic think tank based at Strathclyde University - acknowledges that this is all technically possible, but says it has "never been tried in a country of Scotland's size or stage of development".Mark Carney, the governor of the Bank of England, told MPs earlier in the week that "from the strict economics", a currency union would not require a political union. In an interview last year with BBC Newsnight, Lord King - a former Bank governor - said: "I don't think that's a big question. I think the problem for those who want to argue for independence is that in terms of this monetary solution, it certainly removes in my view the argument against independence, but it does so at the cost of making absolutely clear that Scotland would have no independent say over monetary policy. "It would have to just accept the monetary policy coming out of the Bank of England in London, and it would [also mean] the supervision of the Bank of England. "Andrew Wilson, the former SNP MSP and economist who led the Growth Commission, contends that it would not be a problem for Scotland to follow Bank of England monetary policy as it currently stands. "The idea of having interest rates set as at present is not difficult for me because the Scottish economy performs to the UK average at present, and therefore monetary policy is as fitted to Scotland as to anywhere in the UK at present," he said.However, others have already been critical of this approach, with independence supporter and chartered accountant Richard Murphy arguing that it would be "devastating".He said following UK monetary policy would see any negative impacts of Brexit or other economic changes being "imported directly into the Scottish economy" - claiming that Scotland would "remain enslaved by the pound and tied to the apron strings of London".